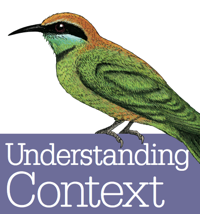 Book / I’m the author of Understanding Context: about how people make sense of their environments, and how we can make those environments better through contextually aware design and (especially) the evolving discipline of Information Architecture. Speaking / I usually speak or teach at a few events each year, across the USA and internationally. Some of these are posted under Talks & Writings. Current Work / My current role is Senior Digital Experience Architect at State Farm. Previous Work / I’ve had a tour of duty with the strategic information architects at TUG, the investment giant Vanguard, and several agencies. Most of my work has been with large enterprises. For more background, see LinkedIn. Blog / I keep a personal blog here; posts are sometimes design-related, sometimes not. Twitter / My tweets are my brain stem’s pressure-release valve. They’re a mess. But they’re my mess.